Tip Settings must be configured in the Transaction Center. Instructions to do so in the Transaction Center can be found here. 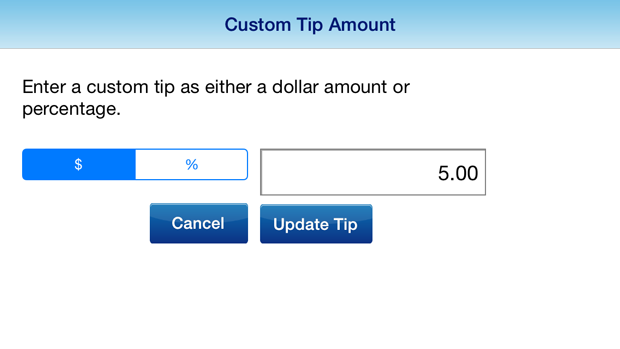 If tip is enabled, customers will be presented with the option of adding a tip at the Signature Screen. Along the bottom of the signature box will be a series of Tip options: No Tip, Custom, 10%, 15%, 18% and 20%. Tap the amount that is going to be added. If custom, select whether a dollar amount or percentage is being entered, and enter the value in the box. Tap Update Tip. Tap 'Submit' in the top right corner.